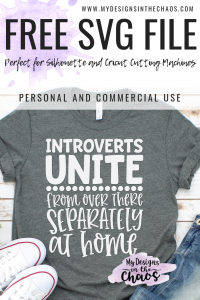 These free funny introvert SVG files are perfect to use with your Silhouette or Cricut cutting machine. I know that you will be able to find one that you can relate to. 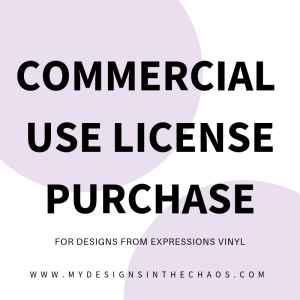 As always we don’t mind if you use our designs on items you make for yourself or for things that you sell up to 200 uses. We do request that they are items made by you in your own home and not sent off somewhere to be mass produced. If you know someone that would love one of these files please direct them here to this post to download. We don’t allow file sharing of our designs. THIS POST CONTAINS AFFILIATE LINKS WHICH MEANS THAT AT NO EXTRA COST TO YOU WE EARN A SMALL PERCENTAGE WHEN YOU SHOP THROUGH OUR LINKS. Isn’t this design so true. Pajamas (and crafting of course) some how make everything better! Please take a moment and pin one of the images above before you download the files. 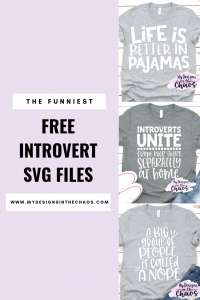 It helps us continue to serve our community and provide high quality freebies this these funny introvert SVG files. Please note: These are zip files so if you are downloading from your phone you will need to have an app to unzip the file and access the SVG. Thanks for stopping by and I would love to hear which design is your favorite! 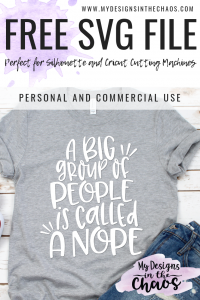 Feel free to comment below, pin your favorite or even share what you made over in our FB group. We also would love if you gave us a tag on Instagram with your finished projects. It is so much for to see the designs come to life! ‘Til next time happy crafting, cutting, and chaos. You NEED to wear the pajama one to SNAP! I love these! 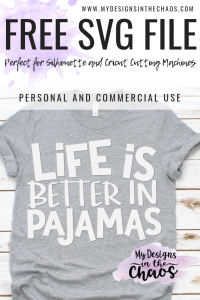 My favourite one is the LIFE is BETTER in Pajamas. Somedays it is just too people-y outside. THANKS! The link to Earth Day SVG’s is linking to PJs not Earth Day… and I LOVE your Earth Day Ideas. I realized that after I sent the E-mail…. so sorry!! You can download the Earth Day ones here.